Following the intervention made by Prime Minister Manmohan Singh, the Finance Ministry is chalking out a revival plan for the beleaguered mutual fund industry which includes energising the distributors, more flexibility to MFs to manage expenses, review of tax treatment and increased role of pension and insurance sectors. The crucial meeting of the Empowered Group of Ministers (EGoM) on telecom, scheduled for today, to take a decision on the contentious issues of setting up the base price for the forthcoming auction of 2G spectrum vacated by the telecom operators following the cancellation of their licences by the Supreme Court in February last, was put off again. 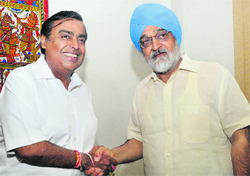 Reliance Industries’ Chairman Mukesh Ambani shakes hands with Deputy Chairman of Planning Commission Montek Singh Ahluwalia in New Delhi on Monday. Rail travellers can breath easy as the government has decided not to levy 12 per cent service tax on passenger fares and freight till September 30. The Small Industries Development Bank of India (SIDBI) is coming up with various development initiatives to promote easy access of finance to the micro, small and medium enterprises (MSME). The bank will soon establish credit facilitation centres for all 400 industrial clusters, besides tying up with other banks to create an ecosystem for syndication of bank loans. 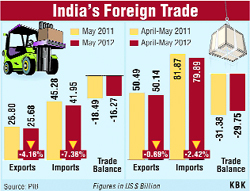 The slowdown in India’s export performance continues with a fall of 4.16 per cent to $ 25.68 billion in May. The Central Board of Direct Taxes (CBDT) has issued a notification making electronic filing of tax returns mandatory for income more than Rs 10 lakh. Barclays today said its Chairman Marcus Agius has resigned following the bank being slapped with 290 million pounds ($451 million) fine by the US and the UK authorities to settle the charges of manipulating global benchmark lending rates. Reliance Globalcom today announced the service launch of the Al-Faw Cable Landing Station (CLS) in Iraq, built in alliance with the Iraqi Telecommunications and Post Company (ITPC). A general slowdown of the economy has had its effect on the automobile industry also with sales for most manufacturers fluctuating in June as the fuel prices and interest rates remained high. Senior officials of the Finance Ministry today met representatives of the mutual funds and distributors to make the industry more attractive for investors. In his first review meeting of the Finance Ministry last week, Prime Minister Manmohan Singh, who now holds the Finance portfolio, had shortlisted mutual funds as an area which needs to be addressed. The Prime Minister had pointed out that there is a need to deal with the problems in the mutual fund industry which is witnessing drying up of flows from retail investors. There are worries over the industry as the gross asset mobilisation by the MFs had seen a decline since 2009-10 and the need to reverse this trend has been engaging the attention of the Government and SEBI. Though inflows into debt schemes have still been alright, inflows into the equity mutual funds have virtually dried up. Part of the reason is the choppiness in the stock market which has not given good returns and the ban on incentives for distributors who are as a result not pushing the product. The Finance Ministry has signalled that it would engage with the mutual fund (MF) industry and the regulator, Securities and Exchange Board of India (SEBI) to attract greater retail participation through innovative financial literacy programmes. Apart from this, special emphasis would be given to improve penetration of MF products in Tier II and Tier III cities and towns and to redress the grievance of investors. This was emphasised by R Gopalan, Secretary, Department of Economic Affairs, Ministry of Finance, during his meeting here today with the representatives of the Mutual Fund Industry and Financial Advisors’ Association to evolve a common strategy to re-energise the Mutual Fund industry. The meeting was also attended among others by the senior officials of the Ministry of Finance and SEBI. The Mutual Fund Advisory Committee of SEBI has been meeting to consider the various steps that would need to be taken to give additional boost to the industry. The objective of the Government and SEBI is to specifically align the interests of all stakeholders and streamline the operational procedures and to achieve higher growth in the MF industry. During the meeting, the representatives from the MF Industry raised several issues relating to compensation payable to the distributors and the increasing preference of investors in other asset classes. The steps outlined for attention were categorised into immediate and medium term plans. The immediate plan includes steps that may have to be taken to energise the distribution network and to provide greater flexibility to Asset Management Companies to manage the Total Expense Ratio (TER). In the face of alleged attempts to drag him into controversies, Agriculture Minister Sharad Pawar today recused himself from heading the Empowered Group of Ministers (EGoM) on telecom, three days after he replaced Pranab Mukherjee in the job. Pawar, who was to chair the first meeting of the reconstituted EGoM today, first postponed the meeting and then wrote to Prime Minister Manmohan Singh recalling how attempts were made to drag him in the controversy surrounding the allocation of 2G spectrum. He said it would be appropriate for him to recuse himself from heading the EGoM. The Prime Minister has agreed to "relieve me from the responsibility of Chairman of EGoM on vacation of spectrum and auction of 3G spectrum and to look into grant of licence and allocation of spectrum in 2G band in 22 service areas," he said in a statement "I am thankful to the Prime Minister of India for giving me the responsibility of heading the EGoM on vacation of spectrum and auction of 3G spectrum, and to look into the grant of license and allocation of spectrum in 2G band in 22 service areas," he said. However, he recalled that attempts had been made in the past to drag him in the controversy surrounding the allocation of 2G spectrum. "These allegations were false and motivated, which I strongly refuted. Neither in the personal capacity nor in the official, was I connected with any of the decision making process in this sector," Pawar said. "At this juncture, I believe that my association in the decision making process as the chairman of the EGoM may further motivate the vested elements to try to drag me in the controversy. As such, I thought it will be appropriate for me to recuse myself from the position of the chairman of the EGoM on this subject," he said. The Agriculture Minister was on Friday named the head of the EGoM after Pranab Mukherjee quit as Finance Minister to contest Presidential elections. At the height of the 2G spectrum controversy and when arrests were made in the case, Pawar's name was sought to be linked to DB Group-promoted Swan Telecom, a beneficiary of 2G spectrum allocated by then Telecom Minister A Raja in 2008. The charge was then strongly denied by Pawar. The eGOM meeting was postponed for the fourth time. The government has to decide the crucial question of fixing the base price for the vacated spectrum.While earlier the country’s highest decision making body in the telecom sector, the Telecom Commission, left the decision of fixing the base price to the EGoM, the panel itself has now put off the decision thrice. In February last, the Supreme Court had cancelled 122 2G telecom licences issued during the tenure of former telecom minister A Raja, and asked the government to complete spectrum auction by August 31. Besides deciding on the base price for the 2G spectrum auction, the high-powered panel was to take decision on other issues like allowing telecom operators to take loan against airwaves which are not a physical asset. As part of terms for payment, the EGoM may allow the telecom companies to mortgage spectrum or airwaves for seeking loans from banks and financial institutions. The Telecom Regulatory Authority of India (TRAI) has recommended an auction start price of Rs 3,622 crore per megahertz of airwaves frequency, which amounts to over Rs 18,000 crore for a pan-India licence. "Government has exempted the core services provided by the Indian Railways, namely transportation of goods and passengers, from the levy of service tax. The exemption will remain effective for a period of 3 months, up to September 30, 2012," said a Finance Ministry statement. The decision to exempt railways from levy of service tax follows a letter written by Railway Minister Mukul Roy to Prime Minister Manmohan Singh, who is now looking after the Finance portfolio, requesting him not to introduce service tax on passenger fare and freight traffic from July 1. This fiscal will also see the bank increase its direct finance from Rs 11,000 crore during the last financial year to Rs 15,000 crore in the current fiscal. This amount will be disbursed to the SMEs by way of equity and quasi equity, receivable finance, finance to energy-efficient technology et al. The exposure in direct finance in each of these sectors will go up by 30-40 per cent during this financial year. Talking to The Tribune here today, NK Maini, Deputy MD, SIDBI, said the bank would focus on development initiatives for the MSMEs in a big way. “As a first step in this direction, we are setting up 100-125 credit facilitation centres for all 400 industrial clusters in the country. These centres will be managed by a retired banker, who will help assess the credit needs of the industrial units and help them get access to loans. We have already started mapping the industrial clusters across the country, where these centres will be set up,” he said. Another major initiative that the bank plans to take is syndication of bank loans. “The MSMEs are always in need of funds. We propose to create an ecosystem with other banks for syndication of bank loans. With SIDBI at the helm of affairs, banks will have the comfort of extending loans to the MSMEs. We will appoint agencies - which could be chartered accountant firms/management firms - who will help the MSMEs prepare their detailed project reports and help them process their loans. These agencies, too, will be under the lens of SIDBI and the loanee will have to pay a processing fee of just two per cent of the loan amount, to be shared among all stakeholders,” he added. Talking about the bank’s initiatives in North India, Maini said the total outstanding of the bank in Punjab and Haryana was almost Rs 200,0 crore, which included both direct and indirect finance. “We had earlier set up a venture capital fund with the Punjab Government for Rs 10 crore. But now this fund is in exit mode, and we are now scouting for partners and opportunities to have a similar fund,” he added. Exports have been falling for months in a row now with the impact of a slowdown in advanced economies in Europe leaving its mark and to add to that the slowdown in the domestic economy is also not helping matters. According to the provisional data released today by the Commerce Ministry, imports dipped by a sharper pace of 7.36 per cent to $41.9 billion. The trade deficit narrowed to $16.2 billion in May, from $18.4 billion a year ago. The contraction in imports reflects slowdown in fresh investments as inward shipments of plant and machinery fell by 8 per cent during the month under review. "The decline in exports is mainly due to the global slowdown and deceleration in domestic manufacturing. Many countries are facing huge setback in exports and India is no exception to it," Federation of Indian Export Organisations (FIEO) President Rafeeque Ahmed said. He said the growth shown by pharmaceutical, dominated by MSME sector, is an encouraging sign and augurs well for other sector of exports. The softening of crude and metal prices also contributed in reduced value-wise exports of petroleum products, gems & jewellery and engineering. This will be made compulsory for assessment year 2012-13 onwards for income exceeding Rs 10 lakh. It will also be mandatory for individuals holding assets, including any financial interest outside India. However, digital signature will not be mandatory for these taxpayers and they can also transmit the data in the return electronically and thereafter submit the verification of the return in Form ITR-V.
Filing of returns electronically under digital signatures is already mandatory for companies and some individuals. The Income Tax Department has received a record number of 1.64 crore income tax returns electronically in the year 2011-12. The electronically filed returns are processed at the Centralised Processing Centre, Bengaluru. The processing for e-filed return is faster and taxpayers get their refunds, if due, quickly. The department also provides some value-added services like tracking of refunds, viewing tax credit status, e-mail and SMS alerts regarding status of processing and refunds to taxpayers who e-file their returns. Agius, who served as the Barclays Chairman for the past six years, would stay in his position until a succession plan is in place. Besides, Michael Rake has been appointed Deputy Chairman. "But last week's events - evidencing as they do unacceptable standards of behaviour within the bank - have dealt a devastating blow to Barclays reputation. As Chairman, I am the ultimate guardian of the bank's reputation. Accordingly, the buck stops with me and I must acknowledge responsibility by standing aside," Agius said. "I am truly sorry that our customers, clients, employees and shareholders have been let down," he added. The bank said it would launch an audit of its business practices, led by Rake and a panel of non-executive Directors. Meanwhile, Barclays said it would begin the search for a successor both from within the existing Board members and from outside under the leadership of John Sunderland. The joint venture is expected to expand the country's broadband and telecommunications links to the outside world. Reliance Globalcom is now the first private subsea service provider to activate submarine capacity and directly connect Iraq seamlessly to the countries in the Middle-East, Asia, Europe and North America. Built with an initial design capacity of 680 Gbps with two diverse routes, Reliance Globalcom has initially lit 50 Gbps on each route in order to cater to the existing market demand. The two diverse routes are integrated into the Falcon network, thereby offering a resilient network. "This will help connect Iraq to the rest of the world through our global networks. The Middle East is one of the fastest-growing regions in the world," said Rory Cole, COO of Reliance Globalcom. While the country’s largest carmaker Maruti Suzuki India Ltd (MSIL) emerged from post meagre sales by registering a 20.3 per cent increase in sales, including exports at 96,597 vehicles in June from 80,298 units sold in the corresponding month of last year, Tata Motors reported a decline of 3 percent in its total sales, including exports, in June which stood at 64,341 units. Domestic sales for MSIL grew 19.3 per cent in the month under review at 83,531 units. Last year at the same time the automobile manufacturer's plant was crippled by strike in June 2011 when it sold just 70,020 cars. Country’s second largest carmaker Hyundai’s sales were up with higher exports to Africa and South America that grew 8.1 per cent and stood at 23,904 units from 22,119 units shipped out in the corresponding period of last year. However, its domestic sales grew only 0.2 per cent at 30,450 units from 30,402 units sold in the corresponding month of 2011. Honda Siel Cars India (HSCI) reported a sales growth of 157 per cent during April-June 2012. It sold 20,076 units as against 7,801 units sold during the same period last year. Skoda Auto India registered a growth of 89 per cent for June 2012 over the same period last year. Its total sales for June 2012 stood at 4,923 units against 2610 units for June 2011. General Motors India has sold 7,364 vehicles in the month of June 2012.